This 16 hour seminar provides the basic training for practicing as a Parenting Coordinator and Parenting Facilitator for licensed mental health professionals and attorneys. This seminar offers participants the opportunity to familiarize themselves with the higher standard of practice involved in working with forensic (Court connected) cases while learning about current research and knowledge regarding Parental Alienation Syndrome, abuse allegations in custody cases, and expectations of attorneys, judges, and other professionals involved with the courts. This seminar offers participants the opportunity to familiarize themselves with the higher standard of practice involved in working with these families while learning about current research and knowledge regarding two homes issues, the Early Moral Forger, professional boundaries, and Parental Alienation. Options will also be presented on resources available to these families. This on demand seminar explores the higher standard of practice needed to navigate divorce, custody, coparenting, and court issues. Gain child-first interventions and protocols for court-connected cases. Agencies and individuals provide family law mediation training. Bradley S. Craig, LMSW-IPR, CFLE works with these agencies to provide training regarding anger management and coparenting. Onsite Workshops - Want Mr. Craig to come to you? This information enlightened and educated me as an LPC about the importance and limits of my license as it pertains to interactions with the court system. I learned about the mental health plug-in to the legal system. Very informational and organized. My expectation was to learn about court processes and different language use. This class met my expectations. I would like other therapists to attend to better understand their rules/boundaries, and the legal expectations of their job. I gained a better understanding of interacting with the court system as a therapist. It was great, thank you. Be ready to learn, and buy the book for your clients. Best coparenting education resources. Very useful information that can help working with families in conflict. Added benefit was the networking opportunity. This class is essential for all family law practitioners. It is critical for us to help our clients navigate these difficult cases, because their behaviors affects their child or children. All appointed ad litems, child advocates, and mediators should be required to to take the portion of the session regarding the "power of words" at a minimum. A+, great training, validating and reinforcing. Great specific illustration and how to tools. Excellent role modeling. Appreciate real life examples. I just love the speaker’s style of presenting. Interesting, informative, knowledgeable. Positive communication skills, great sense of humor. Lots of insight. Concrete tools to use in parent education and mediation. Presenter great style and dynamic. His quick-fire yet encompassing explanation allowed a lot of material to be covered. Reduced audience “stories” so the focus remained on the lecture. I was fully engaged. Probably the best mediation training in 10 years thru the judiciary. I learned new ways to approach and new ways to word my orders, and to use different wording when facilitation my parent education class. I really enjoyed the book, very informative, and the videos used in the presentation. Extremely helpful, different terms that really can give a powerful negative influence on these litigants, or rather should I say these families’ lives and how it affects children. Learning the importance of parent education and giving our litigants the knowledge needed to successfully help their children during the divorce. I thought it was a good balance of presentation and discussion with the class. Excellent, I appreciate your humorous style of presenting to us such useful info in an easy way that I can see myself using in the future. Thank you, can’t wait to read and us my book. Very informative, great presentation style. Has a wealth of knowledge and experience. Great sense of humor! I liked receiving the book and changing terminology used when addressing the parents. Empowering parents to view things differently. It was a pleasure, thanks! Mr. Craig validated a lot of techniques, phrases, and ideologies that I have used and referenced during consent conferences and mediations. He confirmed that I have been on point with the families and my belief that the children are my priority. Valuable information on stages or grief and the stations of divorce and the videos, basically everything that was shared or discussed. Teaches us effective tools in dealing with coparents. The entire presentation was very valuable, but the portion about how parents see the court process was very clever and very true. Everything was great. Presenter was excellent and videos added to the workshop. His sense of humor was also helpful in dealing with/understanding this type of information. Cognitive distortions and examples utilized! It made me examine the language I have been using and how terminology can affect mediation and settlement of parenting issues, the information on high conflict families. Looking at the power of language. Love the examples of questions to ask parents, etc. All the examples that were given, Power Point excellent, can’t wait to read the book. I found the information on high conflict families extremely valuable. Looked at these issues in a different light. Completely enjoyed Brad’s facilitation style. Great presenter!! It was a great refresher and I learned new terms; that was extremely helpful! The videos were interesting. The Power Point was also very good. The training was informative and animated. I really enjoyed Bradley. Bradley was very entertaining! Very informative! Good ideas and techniques. Information about working with high conflict families. This would probably have made a good two day training to practice ideas. Excellent, I don’t like most instructors, so it’s really high praise. Good resources and videos. Informative, cognitive distortions (good review). Presenter enthusiastic and knowledgeable. It was super, every single thing. Perfect mix of lecture, video, and humor. Good speaker, nice blend of content-humor, AV, and power point. Kept everyone's attention the entire day. Great speaker, good information and good use of humor. One of the very best presenters at WIPCOD in the past 14 years. One of the best speakers in the last 5 years of me attending WIPCOD-he was the most one point to the work I do. Great speaker! He was right on track with high conflict families. Learned a lot and reinforced already used practices. Very enjoyable and relatable. Great presenter and kept the audience interested. Very practical effective information for working with these types of high conflict cases. Great techniques to achieve success in communication. Good sense of humor and flow! Bradley was a very engaging presenter. Not all was applicable to WI or attorneys, but overall very helpful, new, and creative. Learned several new practical:helpful theories. Made me think about things in a new way. What an entertaining presenter. He maintained my interest throughout and challenged my thinking on many issues. Love it! Appreciated the additional material e-mailed in advance for review. The session on Thursday was extremely helpful in the context of divorce, separated, post/etc. and my mediation practice. I bought two extra books for two of my high conflict families. Mr. Craig had a confident and humorous speaking style that made his presentation educational and enjoyable. Very good information, thank you! Very helpful and informative. As a social worker I appreciated the perspective from a mental health side. The speaker was very engaging, had interesting stories, and had good knowledge/experience to share. Learned a lot, I took several pages of notes so narrowing down to one valuable thing is hard. All of this is valuable. This class met my expectations to help me prepare for more forensic roles. Helped clarify my role as a counselor versus facilitator. Gave me the ethics as well as reality. Learned considerations for therapists working with children in two homes, especially legal considerations. Gained more options to share with parents. Brad is always entertaining and interesting when he speaks. His seminars have had some of the best content, delivered in lively way that keeps you engaged with the material. I can't wait for the next one! Brad Craig has years of experience helping both professionals and parents understand best practices for working with children with two homes. His presentation is thorough and covers the many policy and practice implications of these family's’ dynamics. Yet he is also warm and approachable, inviting questions and providing clarity. The result of this formula is that everyone can go home with some big ideas, maybe a future program plan, and at least one thing they will use in their practice tomorrow. Very enthusiastic, knowledgeable, and entertaining speaker who engaged the audience but also kept the training on track. Brad kept our attention the whole day with his combination of conveying the seriousness of, and complexities involved in, our intervention with families while using a blend of humor and multimedia. Not only am I now better prepared to work with court while protecting my license, but I now have some new tools for my direct practice with families raising children between two homes. The class met my expectations, it was very good. Specific legal information (does/dont's) in reporting to the court. Defining who the therapist reports to, again in court ordered referrals and self referrals. There was a wealth of materials available through the e-files. Present in this part of Texas at least annually. Well done! All of the information was very relevant to working with child custody cases. Excellent! I learned a more clear definition of my role. Exceeded expectations, thank you. Most valuable thing...the difference between a forensic and therapeutic role. You are awesome! The speaker, Mr. Craig, was very effective. He conveyed the seriousness of the issues dealing with the topics covered regarding divorced families. In addition, his speaking style and tone of voice made us very aware and kept our interests. I am thankful that he spoke to us and as a future family law attorney, I hope to recall some of these do's and don'ts with my own clients. Thank you Mr. Craig. Speaker was very enthusiastic about the subject matter. He is very approachable and open to questions. Very entertaining, informed, and energetic speaker. I appreciate how he spoke quickly, yet informatively. Found the information very insightful. Mr. Craig is funny and makes it easy to understand concepts. His examples were great. I will be able to take so much of what he taught in to my legal practice. Very applicable and practical information without falling in to "touchy feely" language. Speaker was great at keeping class attention - dynamic and humorous. I really enjoyed the training this evening. I have relatives and close friends who have been through divorce and custody battles. This classes has helped me better understand what the kids must be experiencing. I know this will also allow me to better communicate with my clients as an attorney and help prepare my clients to recognize some of these issues. These are topics not discussed in our law classes, but they should be brought to our attention and taught in some way if any student plans to practice family law. Overall, the presentation was very informative. Every parent going through a divorce should attend Mr. Craig's classes. In the future I will be sending parents to see him. I enjoyed this training- even though when I walked in I wasn't feeling so well. The issues in families that are splitting up really affects the kids in the future if they are not resolved quickly. The parenting plans seem realistic, not out in "la-la-land." The speaker today must be an excellent mediator. He seems energetic, knowledgeable, and respectful of people's emotions during this ugly time of divorce. Thank you for sharing a variety of options for us to utilize. Your presentation opened a window a lot wider allowing us to see the true possibilities for empowering families. Excellent, impressed with your outline, and your approach is a very good one in helping family problems. Very informative and interesting. Dynamic presentation. Excellent, fresh view point. Good practical advice. This was excellent-Best program/training I have ever attended. I will definitely follow up and attend more of your training and classes. Mr. Craig was excellent. His presentation, though rushed, was very passionate. It is obvious that he is very committed to the cause of helping adults be better parents and lessening the negative impact for children of divorce. I would love to take some of the classes. This was the most informative session dealing with issues of psychology of divorce, of this training. Thanks Brad. Great Presentation - liked the pace, volume, and humor. Obviously just a brushing over the surface- could have spent whole day on this. A++++++ Great, pulling together 72 hours+ in training. Excellent putting it on their level- visit vs. two homes. Brad, great presentation. Keep up the good work. Wow! What a great program. I never knew this existed. What a powerful compliment to the mediation process. I will certainly make this my first step for my current divorce. I'm ready to take your coparenting class. I'll be in touch soon! 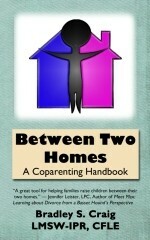 Good explanations/strategies re: coparenting benefits- Very animated speaker. Good presentation- Very informative. Enjoyable presentation- Excellent examples. Brad is enthusiastic and draws the audience into the topic! Great job! I learned a substantial amount and would certainly recommend your services to anyone dealing with these issues! Original, creative, helpful, forward-thinking, progressive. I was extremely impressed. Thank you! Thanks for the information. I will use all this information in my mediation sessions in New Mexico. Very helpful! I would love to come to your class some evening! Rapid speech, but did not appear to hinder quality and content. Results were beneficial to training. Very good, wish I could get a tape especially on the aspect of what the child needs. I would send the tape to people I know who need to understand how the child feels. Would like to hear speaker again. I found that your information is very well prepared and your knowledge is outstanding. You made good, clear points that need to be addressed to a group like us. I this it is good that you work with the parents communication skills and appreciate your suggestions to us. I wish the speaker had more time. He had great information. He was great considering we had been here all day. He was very passionate and excited about the information he presented. It was easy for me to listen and get excited. I thought ALL the information was important and helpful. I learned a great deal. Thank you! Excellent- I learned a lot! Very entertaining and informative. I want to come see your classes in person. Would like to have had more time for this segment. I learned about how to start the mediation process. Brad has excellent oratory skills and should be making self-help tapes for parents-and maybe teenagers. I have been very impressed with all the creative programs you have established through Children in the Middle and sincerely hope you continue to expand and bring resources to more communities outside the two metro counties of Dallas and Fort Worth. The most pragmatic and helpful thing yet! Coparenting in 80 seconds - wow! Lots and lots info. in a short period of time. Excellent!!! Good use of humor. Did an excellent job. Very informative- a lot of information. I had very high expectations for a complete explanation of the parenting coordination process, and I was not disappointed. Great job by both instructors and would recommend them to anyone. I love the dialogue of spontaneous conversation. That "best interest" is complex and there are no "standard" solutions. Great handouts that will provide good information for reading and reference. I like the change of pace that you used on Saturday. Learned guidelines/ethics/role plays, specific examples of forms, and instructor's expertise (ability to explain through examples. )\Good overall presentation, great resources, learn what it means to be a PC. Goal was to learn definitions, procedures, functions, cautions and practice of parenting coordination. The class met those. I enjoyed your interaction, your working off each other to amplify the information. Valuable information= the commonalities among families and the uniqueness. The vulnerability of children-so the most important thing was how to protect children. This was one of the 2-3 best (training) I've had in 14 years of mediation. Brad and Aaron were great! I felt this was excellent training- PC training. Both trainers were able to give real life experiences. Craig and Robb know their topics-covered questions-worked well together. Covered topic well-provided good forms and references. Most valuable= discussions coupled with videos and role plays. Helpful= ability to answer questions with personal experiences. Both were highly skilled-knowledge, and practical implications. Brad is impressive-his expertise on coaching. Good info, good presenters. Brad and Aaron were great! Brad and Aaron-Excellent. Thanks for providing quality training. I am impressed with the highly professional presentation, handouts, appearance, humor, and language skills. The presenters interacted well with each other. Brad Craig has been a lecturer at the Texas A&M School of Law (formerly Texas Wesleyan) for the past 18 years and also was a presenter for me at Texas Woman’s University for 16 years. He is one of the best presenters I have ever hired. His material is meticulously researched, prepared, updated, and presented. In addition to being an expert in his field, he is engaging, funny and flexible. Brad is not only a masterful presenter he is a good person. The students who have the opportunity to meet him and learn from him are uniformly impressed and engaged. I have also taken my law students to Brad’s Children in the Middle workshops for divorcing parents embroiled in custody disputes. This work he has done for more than 20 years and he is acknowledged by all of his peers as the most dedicated and knowledgeable person on this topic. Few presenters I have seen are able to convey with accuracy and compassion the importance of understanding what children go through in a divorce. Brad gets it and even starts his presentations with a credibility statement: “I was a child between two homes”. His own testament to a life well lived and the importance of parents putting aside their negative feelings to focus on how to help kids adjust to the family restructure is his life mission. I admire Brad and I like him. Everyone that knows him seems to agree: he is a tremendous asset to his profession. There is so much that could be said: he is always on time, always prepared, always energetic and puts his heart and soul into every presentation. He communicates information on a deeper level: his understanding of the nuances of the human mind and personality are woven into the data in a way that keeps an audience engaged and receptive. I recommend him highly for any speaking engagements. Kay Elliott J.D., LL.M., M.A.